Police chief Delaney Kurdyla conducted a motor vehicle stop inside the McBride Avenue firehouse on Tuesday afternoon. She approached the driver side door of the Dodge Journey Crossroad and ordered the suspect out of the vehicle. “Cuff him up, we got a gun in there,” said police officer Troy Oswald, who joined the chief at the scene to assist in apprehending the suspect. Kurdyla used three handcuffs to place the suspect under arrest. She then called in the K-9 unit to search the vehicle. A handgun was recovered under the driver’s seat. Suspect was secured in the back of the chief’s marked vehicle for transportation to headquarters. The motor vehicle stop at the firehouse was one of handful of activities devised for the police chief for a day program. 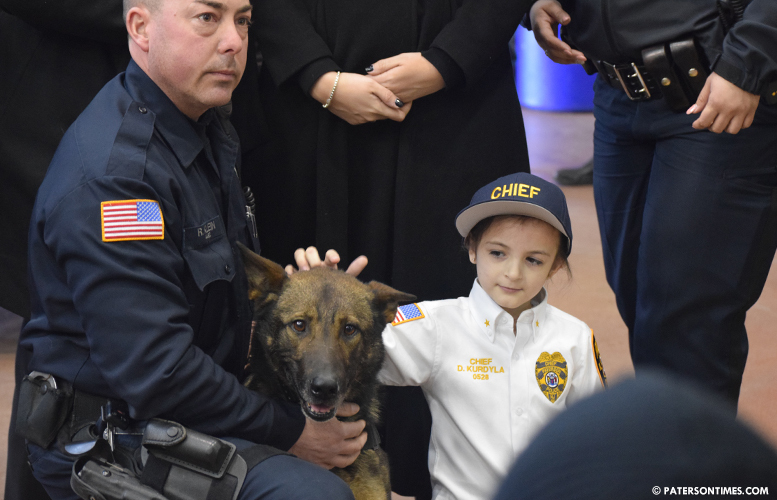 8-year-old Kurdyla had been counting down the days, said her mother Kaitlin Kurdyla, to when she would become police chief. 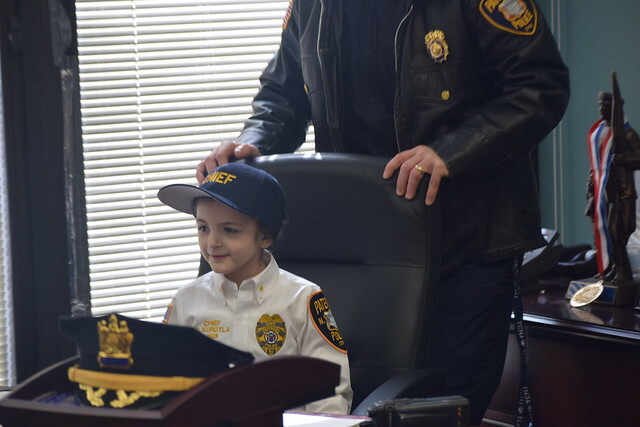 Paterson Police Department and St. Joseph’s Children’s Hospital made the day possible for the youngster, who had been diagnosed with Neuroblastoma, cancer commonly found in the adrenal glands, when she was 2 or 3 months old. “She’s been through so much in her life,” said Jill Menell, chief of pediatric hematology and oncology at St. Joseph’s Children’s Hospital. She had to undergo chemo and radiation treatment as well as a bone marrow transplant. Kurdyla continues to receive treatment for complications from the treatment and pain management. She visits the hospital twice a week for acupuncture and massage therapy. She has to take pain medications every day. She is not able to go to school, said Menell. She is being homeschooled. “She has just been so excited for today. She asked if Paterson ever had a female chief before, they told her no,” said the mother. Kurdyla was sworn-in as the first female police chief at the Frank X. Graves Public Safety Complex. She was escorted from her home in Woodridge to the police station in a motorcade. “It was really cool,” said Kurdyla after conducting roll call. “People in motorcycles were next to us.” She rode in a squad car. Kurdyla had to stand in front of a desk on an elevated platform to conduct roll call. “Go be safe out there,” she said in dismissing her officers. Kurdyla had been taken with law enforcement and military from an early age, said her mother. The mother said she saluted a pair of military men outside the Port Authority in New York when she was three years old. Both military men were impressed, said the mother. The young girl then thanked them for their service, recalled the mother. She got on well with policemen and women – her subordinates. She was clad in a white police chief’s uniform donated by Harris Uniforms of South Hackensack throughout the day. She said her favorite part of the day was the K-9 demonstrations at the firehouse. “I love them,” said Kurdyla of the dogs. She particularly liked the demonstration where she hid contrabands that the K-9 sniffed out. The chief rewarded the dog with a tennis ball after it found the contraband that she had hid between a pair of garbage cans. “I love that he could do all these tricks,” she said. One K-9 apprehended a suspect. She said she was slightly afraid when the dog aggressively attacked the suspect in the mock apprehension. Kurdyla has a pet coonhound that’s slightly smaller than the police K-9 dog. The youngster received a lot of souvenirs from police and fire officials. She received a police skull cap, Ceasefire and Street Crime Unit coins, and a community policing blanket. She also received a gift basket. Fire chief Brian McDermott gave her a bag and a pink helmet. Kurdyla also had the chance to make her mother a police lieutenant. She promoted her mother as a lieutenant with a salute inside the chief’s office. “Just like always, I still work for you,” joked the mother. The youngster had the entire police force working under her for a day. See why I so love my men and women in uniform. The respect the emphasis they show to this young lady that what make these fine men and women stand out. Thanks for taking the time to make the young lady feel like a chief. Love her question about a women chief. It’s coming .